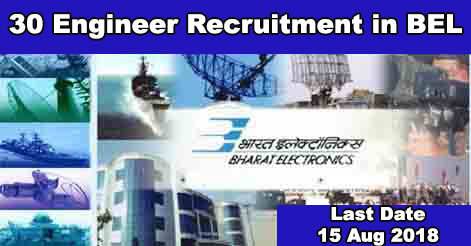 Bharat Electronics Limited (BEL), a Navratana company has released an advertisement for the recruitment of 30 Contract Engineers under various departments. These Engineers to be posted at Bangalore on Contract basis for its “Network & Cyber Security group in MilCom SBU” for a period of 2 YEAR. Contract Engineer First Class for General & OBC Candidates and Pass Class for SC/ST candidate in BE / B.Tech (Computer Science / Information Science) Disciplines from a AICTE approved institution / University. (i) Exposure to AI, NLP and Machine Learning is advantageous. (i) Experience in software application development using Java / Java EE, Java Script, HTML & CSS. Period of Contract: 2 Years from the date of joining. However the same may be extended depending on the progress of the project and performance of the candidate. Applications are invited through online mode only. Applications received in any other format would not be considered. Candidates are requested to apply online through official website. Selection will be done through written test and interview of shortlisted candidates based on performance in the written test. The written test will consist of Objective type questions from basic Engineering subjects, in the respective disciplines / specializations and General Aptitude. They qualifying candidates will be required to appear for an interview for final selection. Help us to improve this article/job posting "30 Engineer Recruitment in BEL". We would be glad if you can comment below and provide your valuable suggestions and feedback. If this page have any wrong information/list or out of context content, then you can report us as well.